Happy Birthday to my Mom! I’ll be spending the day with her today. But here is a quick post to show you the birthday card I made for her. Hopefully I’ll get to her house and give it to her before she see’s my blog. 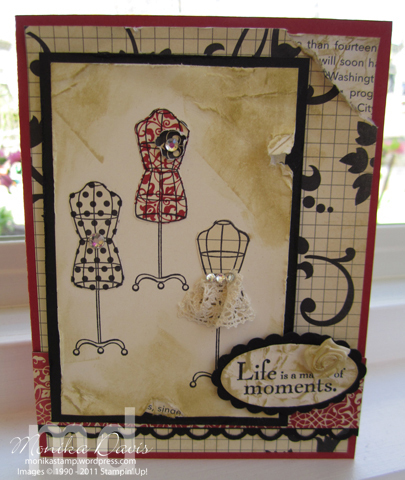 This card may look a bit familiar if you follow Shelli Gardner’s blog – she is the head of Stampin’ Up! and this card was on her blog. This card uses some new items in the Occasions Mini Catalog – Elegant Bird Bigz Die for the Big Shot and the Pleated Ribbon in Baja Breeze. And there are two products from the Sale-a-Bration brochure – Fresh Vintage stamp set and the Everyday Enchantment Designer Series paper. The paper has Lucky Limeade but I actually used Certainly Celery for the card base and the button. The bird wings are embossed with the Vintage Wallpaper embossing folder which is hard to see in the picture. To attach the Pleated Ribbon I ran a strip of snail across the base of my card stock and then attached the ribbon to it – rather than trying to put adhesive on the ribbon itself. This has worked for me. Sticky strip is another option. There is also a piece of stamped twill tape. And speaking of birds – its that time of year where the birds are house hunting and if you have followed my blog over the past few years you know I blog about the birds in my yard throughout the spring. I’ve been noticing a woodpecker checking out the woodpecker house – so I’m crossing my fingers that I’ll have a nesting woodpecker this year. This week I also noticed some chick-a-dees going in and out of one of the houses – its the same house they used last year – so maybe they will be back. No activity on any of the other houses right now. Happy Birthday to you mom! I love you! Posted in Big Shot, Cards, Occasions Mini 2012, Sale-A-Bration 2012, Vintage	| Tagged Big Shot, Monika Davis, Occasions Mini, Sale-a-Bration, Stampin' Up! 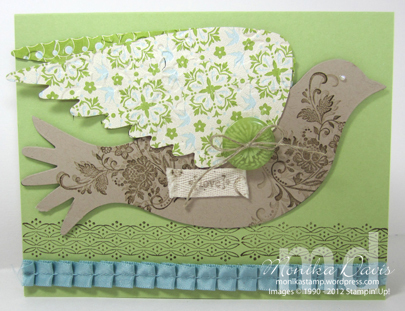 This beautiful card was one of the creations we made in my April Hands On Class. 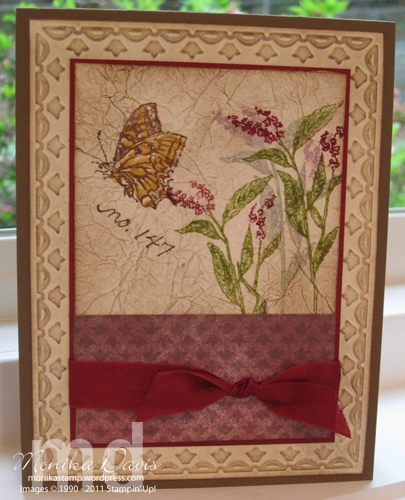 It uses the Nature Walk stamp set from the Occasions Mini Catalog and a technique called Faux Silk. This particular card design is from Sandy MacIver – she is a very creative demonstrator. Nature Walk is one of my favorite stamp sets and I’m hoping so much that it ends up in our next Idea Book & Catalog so I can keep using it for classes and clubs. I think it is so pretty that I bought the wood set so I could put it out on a shelf for decoration! I just love all the images in the set. So when I saw this design from Sandy I wanted to use it. Other items from the Stampin’ Up! Occasions Mini Catalog that I used are the Framed Tulips embossing folder, the Botanical Gazette Designer Series paper and the Cherry Cobbler seam binding. The Mini Catalog ends in just a few days so hurry if you would like to purchase any of these items. I do know that the embossing folder will continue to be available but not the other products. I always hate the end of a mini catalog – especially this one it had so many wonderful products in it – I only hope that is a sign of what’s to come in our new Idea Book. I hope your Easter was wonderful – ours was just perfect. We were here with 32 family members and friends. We had great company, great weather and wonderful home cooked food. We had three tables set up in the new sunroom and it was perfect. This year we had a lot of different states represented – while most of the group was from all over Georgia – we also had some from Indiana, Florida, South Carolina, Louisiana, and even one from California. How fun to have us all together in one place. This card has a variety of “techniques” on it. Quilting – using various pieces of Designer Series papers that have been pieced together like a quilt. Embossing – using the embossing folder over the quilted piece. Distressing – using the cutter kit on the outer embossed panel. The card base is Rose Red. Then a layer of Very Vanilla that was embossed with the Framed Tulips Embossing Folder – distress the edges with the distressing tool in the Cutter Kit, and sponge with Sahara Sand ink. To create the quilt piece I glued the rectangles of Springtime Vintage Designer Series paper onto a piece of Very Vanilla card stock. Then cut it using the Big Shot and the Top Note die. Then emboss with the Vintage Wallpaper Embossing Folder. Make sure to cut first and emboss second. I also cut a piece of Rose Red card stock with the Top Note die and cut it in half long ways. Take each half and glue to the back of the quilted piece to create a faux frame. Tie a piece of Rose Red Seam Binding around the Top Note before adhering it to the front of the card. To decorate the front I used the Beautiful Wings Embosslit and cut butterflies out of Very Vanilla card stock and sponged them with Sahara Sand ink. 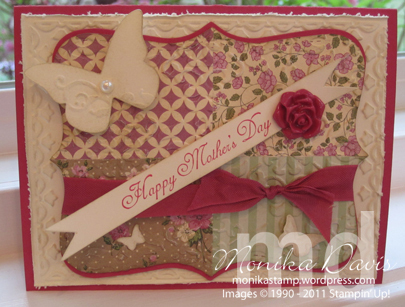 I used the Petal Cone die to cut the banner from Very Vanilla card stock – stamp with Rose Red ink and “Happy Mother’s Day” from the Something to Celebrate stamp set. A Pearl was added to the center of the large butterfly and finally using a small amount of Crystal Effects (so it wouldn’t fall off) I added a Vintage Flower Adornment to one side of the banner. Many of these items are in the Stampin’ Up! Occasions Mini Catalog which ends on April 30th. I do know the Petal Cone die, the Framed Tulips Embossing Folder and Rose Red Seam Binding will still be available after the Mini end but don’t miss out on the Springtime Vintage Designer Series paper, Vintage Flower Adornments or the Something to Celebrate stamp set. 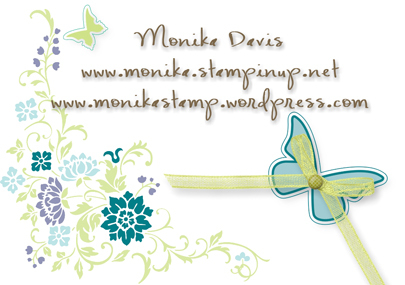 You can order online 24-7 on my website – www.monika.stampinup.net – just click on the SHOP NOW button in the upper left corner – or send me an email and I can place the order for you. I have another Vintage card to share today. This idea is one that I found on Stampin’ Connection – an idea from Regina Cornelius. I love the Love Letters Designer Series paper and it works perfectly for vintage. So when I saw Regina’s card I knew I had to make one too because I love the colors. I have also been wanting to try out the Distressing Essentials kit from the catalog – I can’t believe I have waited this long to try it out. So here is my version of the card. The dress form from the Sew Suite stamp set in the Occasions Mini catalog is stamped onto the Very Vanilla card stock and then stamped again on different pieces of Designer Series paper from the Love Letters pack. These were cut out and layered on top of the others so each form looks like it has a dress on it. The edges of the paper were crumpled and then distressed using the Tea Stain spot and the square stamp that comes in the Distressing Essentials kit. The one dress has a little piece of Chantilly Lace attached with mini glue dots to create a pleated skirt look. Some rhinestones were added to each dress too. I think Regina’s card was great and I hope you like my version too.